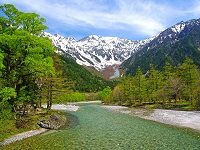 Toyama Prefecture is located in the Chubu region and consists of part of the Northern Japan Alps. 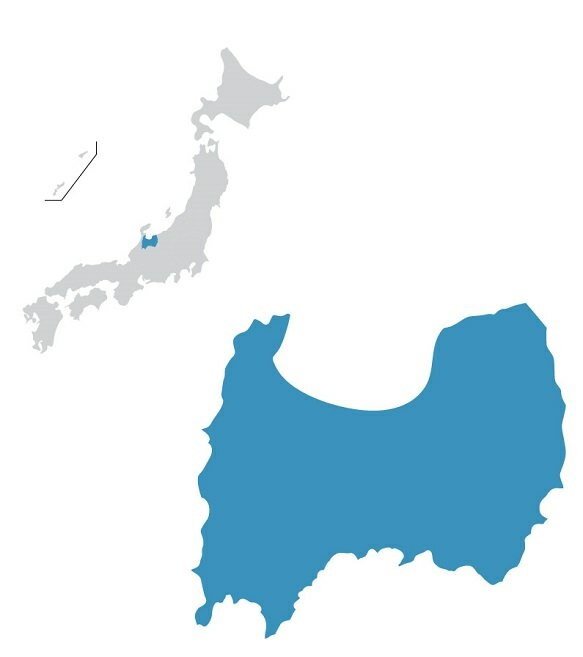 Toyama with Ishikawa Prefecture borders Toyama Bay, one of Japan’s three largest bays, which is famous for its firefly squids that emit blue light on its shores. 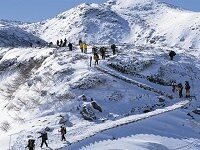 Toyama also includes Shirakawa-go and Gokayama, which are UNESCO World Heritage Sites. 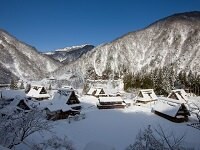 Shirakawa-go and Gokayama feature traditional gassho-zukuri farmhouses whose roofs are built without nails. 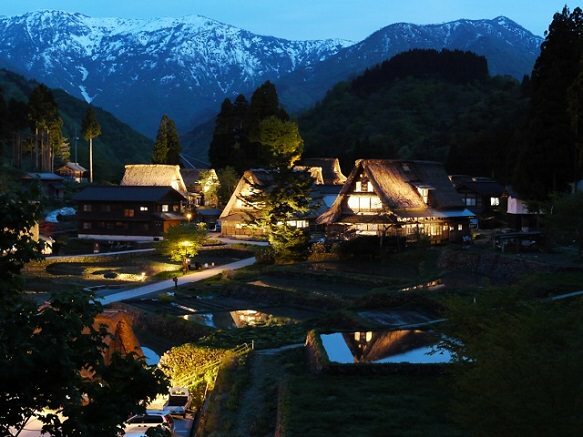 Tourists can even stay overnight at one of these farmhouses, some of which date back to over 250 years, and experience a traditional Japanese lifestyle. 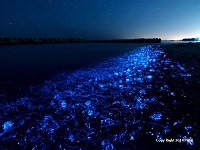 Toyama has several local cuisines including the “hotaru ika”, or firefly squid . Hotaru ika can be eaten in various ways but is most commonly eaten as “hotaru ika no karashimiso ae”, or mixed with Japanese mustard. 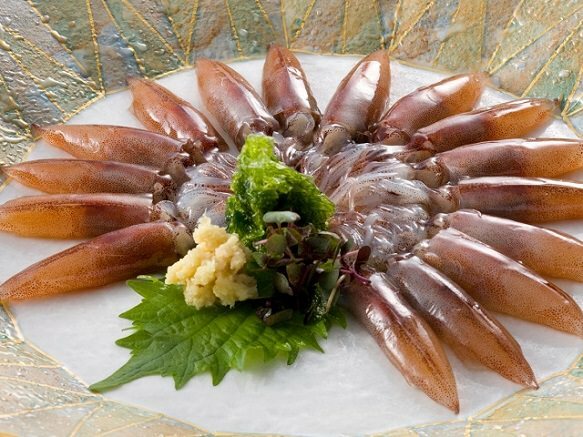 Hotaru ika can also be found as a sushi option, and looks very different from a normal squid sushi. A local Toyama dish is “masuzushi”. Masu (trout) sushi is a round pizza-like wooden mold filled with sushi rice with slices of trout sashimi on top. The rice of the masuzushi is pressed down like that of an oshizushi. The bamboo leaves that wrap the sushi and the vinegar rice preserves masuzushi for about two days. Masuzushi are popular food gifts for locals and tourists and are sold as eki-ben, or train station lunches. Takaoka City, located in Toyama, is famous for its Takaoka bronze ware. 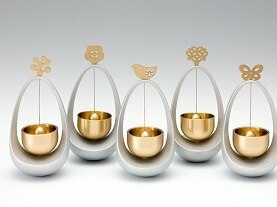 With over 400 years of history, it has been used to create various products from vases and incense burners to utensils and even Buddhist altar equipment. 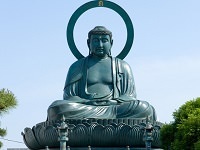 In fact, Takaoka bronze ware accounts for a great amount of the bells and Buddhist statues in Japan. Takaoka bronze ware has spread outside of Toyama and made its way to large department stores in Tokyo. Kotorin bells and tin wind chimes make great souvenirs. 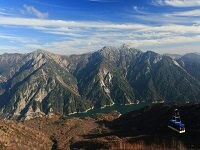 "Owara Kaze no Bon" is a over 300 year old festival held in Yatsuo, a town in Toyama. The three day festival attracts as many as 200,000 spectators with its elegant dance. A slow folk song called "Ecchu Owarabushi" is played by shamisen, a three stringed Japanese instrument, Chinese fiddles, and drums. The dancers are rather quiet, unlike most festivals, and the sound of instruments and a high pitched female voice is all you hear. 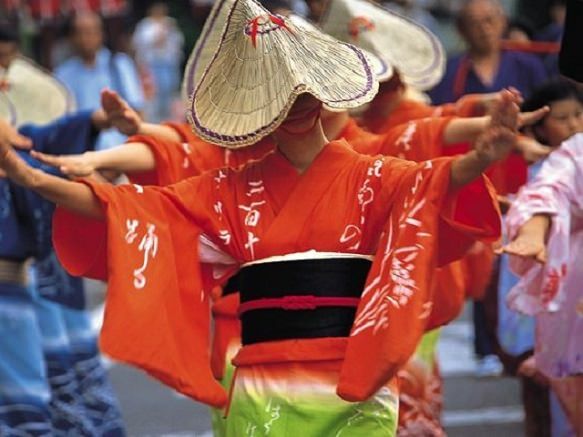 The festival is held at nighttime, and the dancers' faces are covered with hats that match their kimono, adding a bit of mystique to the festival.